We gaze upon the Failing Tower, our everlasting Vigil. Children of the Crab, Hoom-born of Stone, Water, and Ashen-Sky. Keepers of their Horns, who bear a thousand names. Upon our backs, the Mourning Garden, above us the lights of passing Kin. Duty-bound to undying-star, their wisdom shall we ever guard. To Hearth and Home we swear our lives, and in their honour, we do not sleep. Our Great Crab shall rise once more, and to its’ mourning song we march. House Redoran's particular Tribunal is Vivec. Understanding House Redoran is to understand complex warrior-societies within the context of Morrowind’s social framework. They are the guardians of Morrowind. 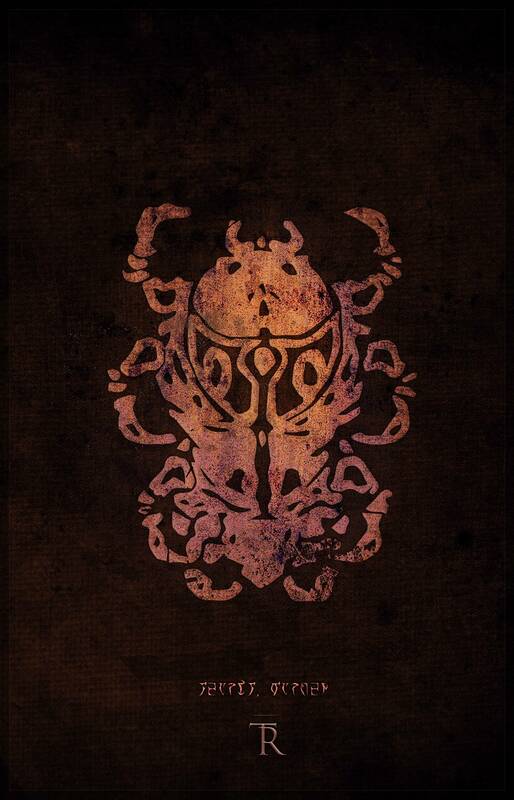 Like most of the other Houses of Morrowind, House Redoran embodies their society. In the case of Redoran, the values of kinship and deed closely are intertwined into the fabric of everyday life, and ones that ultimately define their worldview. It’s easy to generalize the Redoran as simply being warriors and defenders, when indeed this is not the case. Primarily speaking, Redoran culture is dominated by the concept of fictive-kinship, in which kinship is derived from one’s deeds and values, rather than that of consanguinity. Familal-ties form the backbone of Redoran society, so much so that one’s clan is a badge of honour in itself. The shield is a honeycomb, woven through ages of deeds and sacrifices immortalized in the collective wisdom of the many clans that form House Redoran. The rituals of the various clans are rooted deep in oral and written traditions, passed along the generations, and can vary between different communities. The strongest and of these clans martial other lesser clans into three distinct “marches” that oversee the large swathes of territory that form Morrowind’s western border. In the north lies the Ashes-march, that traditionally encompasses Morrowind’s border with Skyrim, including the badlands of the Julan-Shar, and the Grey Meadows. Further south is the Stones-march, consisting the rocky valleys of the Roth Roryn and the Clambering Moor. The southernmost march is the Waters-march, which once guarded the strategic waterways of the Thirr and Othreleth. Each has its own homestead, which contains a council hall. Each march has its own council, made up of the patriarchs and matriarchs of great families. The members of the council all have unique, militial titles which together create an image of Dunmer war tactics. The leader of the council of each March is called the Crab-Chief. In times of war, the greatest of these crab-chiefs gathers at the Skar-Home to form the Redoran War Council. There, they elect their Hortator who serves as head of House. Outside Baan Malur and the march-homes, other Redoran mostly live in clansteads that dot the various marches, living amongst the people they protect. Redoran are not individualists, but they are locally oriented and provincial compared to the House Indoril. They tend to conceptualize the House Redoran in terms of their immediate family and community rather than the House at large. More regarding their particular character tropes is described later in this document. Like all great houses, House Redoran traces its origins to the First Council. It regards itself as the continuity of the Council in matters of war and the defense of Morrowind, the Dunmer and the Tribunal (who, as sovereign dieties, are Morrowind and are the Dunmer). The House's Crab-Chiefs and War Councillors elect a Hortator to lead them in matters of war, and they therefore regard Indoril Nerevar as the first head of house. During the Battle of Red Mountain, the members of the Second Council who became the fathers of Redoran came into battle on great war crabs, the greatest of which was the Skar, which died during the battle on the western slopes of the mountain. After the battle and after the proclamation of the Tribunal, the Redoran returned to the Skar to have their first council after the death of Nerevar. There, some who supported Sul Alandro split off, along with others from other old houses, and became the Ashlanders, while the rest formed what would eventually become the Great House Redoran. Over time, it took the form described on the previous page. Late in the end of the Second Era, the Tribunal closed Morrowind except for the holy sites. Redoran's only presence on Vvardenfell thereafter was protecting the Ash Face of Vivec at Gnisis. They dragged the body of the Skar to the mainland and put it either in the heart of Baan Malur. Since the rise of Dagoth Ur and the construction of the Ghostfence, the Redoran have consistently elected a Hortator as they continue to be at war with an active enemy. When Vivec re-opened Vvardenfell, the current Hortator Bolvyn Venim managed to secure for House Redoran a considerable portion of the land in Vvardenfell, where several settlements have since been built. They moved the Skar back to Vvardenfell, dragging it overland with hooms and floating it over water, guided by lampskates. The Skar is very buoyant because it is a crab exoskeleton. Nowadays, Bolvyn Venim and the War Council are face-to-face with Dagoth Ur, but have devised no way of halting his advance. Venim is essentially, and at some level consciously, on a suicide mission to Vvardenfell, with the Scarab-Chiefs of each Redoran March with him. The House Redoran is floundering without guidance or leadership. Slaves: Since status within Redoran clans derives from one’s own deeds and strengths, the Redoran do not believe it is honourable to shoulder one’s burden on lesser-races. As a result, the Redoran do not own or keep slaves. Maintaining slaves in the rugged regions of Velothis is also considered unsustainable. They however, are not abolitionists, and should not be portrayed as such. Outlaws and bandits often traffic slaves throughout the isolated passes of the Velothi Mountains however. Commoners: Commoners in House Redoran territory are the Velothi that live under the protection of the Redoran’s Clan Chiefs. They can also sometimes be lesser-kin of the clan-families themselves. Many serve as traders and frontiersmen in the service of a particular clan. Unlike the Velothi in lands further south and east, Commoners mostly live in the communes of the various-clan families, in the same bugshell-homes that the Redoran themselves dwell in. It is very possible for commoners to attain kinship with a particular clan, and become Redoran themselves, though most prefer living outside the umbrella of clan kinship, and the rituals associated with it. The Redoran population generally monitors and subsists off the land, some living in small permanent settlements with limited services while others either set up camps in the wilderness or move between seasonal settlements. By necessity, fishing and egg-mining communities tend to be more persistent and a little larger than inland communities focused around foraging, herding, etc. Redoran: Redoran society is defined largely by individualism and kinship, rather than monolithism. Many Redoran, having descended from Velothi warrior castes view the concepts of nobility, kinship, and leadership differently, in which one’s status within society is defined not necessarily by wealth or name, but one’s direct influence through deeds. In that sense, their social structures are more pragmatic than those of the other houses. The highest echelons of Redoran society are comprised primarily of accomplished clan elders well versed in the various traditions and stories of the House, and Crab Chiefs that are responsible for marshalling the often disparate clans of the Redoran Marches. Other, lesser clans often patrol the marches, alongside their retainers and kin, and combined, form the armies of the Redoran themselves. That is not to say the Redoran are without vanity. Their vanity derives from their sense of independence, which is also the source of internal tension. As mentioned previously, the Redoran are very provincial in nature, and their many clans often march out of step, causing dissonance within the House. Many clan leaders often have their own, local interests, rather than the interests of the House at large. Many individual Redoran pride themselves on individual accomplishments and martial association with their various clans. Duels are often a way to settle personal disputes, or disputes amongst the clan-families. Redoran conventions are often uncodified, and are often passed through traditional songs and intense rituals that often vary from clan-to-clan. Their culture bears a strong resemblance to the Ashlanders, in a sense that they view things rather simplistically. They more often fight for themselves, rather than a particular cause, though they believe that by serving oneself, they by extension, serve Morrowind. They are proud and boastful, but also down-to-earth when it comes to duty and honour to one’s self, clan, and the nation of Morrowind. Their sense of duty will often trump their personal feelings. Redoran are very proud, and take any insult to their pride very seriously. That is because, while Redoran warriors are individuals, they represent their clan and ancestors as well. When they are honoured, their clan is honoured. When they are slighted, their clan is slighted. However, they are not stupid and inflexible. Redoran are well aware that everything has a time and a place, and will ignore slights -- at least for a while -- if the situation calls for it. Redoran are also not without levity, and don't take everything seriously. However, they tend to present a stoic facade to strangers, and for strangers it is generally better to be stoic among Redoran as well: humor doesn't translate well between alien cultures, and even when a western joke isn't interpreted as an insult by Redoran it is unlikely to be understood or go over well. Power structures within Redoran society are organic – leadership and authority are not necessarily hereditary. Even kinship itself is not necessarily defined by blood relations, but one’s prestige and skill. As such, the Redoran often compete amongst themselves, both in times of war and peace. While aligning oneself with an influential clan-family has its’ benefits, in times of war, the Redoran tend to favour those who are best suited to lead them, depending on factors such as one’s martial skill or prowess, both on a house-level, and on a personal level. Blood ties are of secondary importance. All Redoran parents aspire for their children to take on a name with more prestige than their own. If the child fails to gain a patron, then they will usually be offered their parents' name. If for whatever reason they aren't granted their parents' name (usually for reasons of family breakdown) and they can't find anyone else to lend them their name, then they have the status of pariah in Redoran society. With such a decentralized population, it was only natural for pre-Tribunal clans to set up meeting places where they could engage in inter-clan politics, including duels. These meeting places grew in importance as the Redoran became more unified, starting from around the time of the First Council: the meetings became increasingly common until permanent councils were established, and those councils gained in power and influence. To reflect that, Redoran warriors started to build huts around the council houses, so as to be able to protect them from threats. As such, at their core, Redoran cities are actually strongholds which are supplied from outlying Redoran settlements. While commoners do live in the cities, they overwhelmingly belong to minorities, such as former outlanders and non-Dunmer. Due to the frequent dust bowls that were endemic in the ash wastes and desert badlands of Western Morrowind, Redoran architecture is uniquely shaped to weather harsh conditions, adapting the organic forms of bugshells and appropriating the shells of other indigenous anthropods as their dwellings. Major Cities: The only true city of House Redoran is at Baan Malur. It is large because of its’ location of millitary significance, as well as its’ importance as the place where Redoran conduct affairs of state. It is also home to the region’s only Arena, which functions as a court of last-resort, where Redoran families often travel to settle disputes that cannot be settled in local or march councils. March-hives: March-hives, or March Capitals, are the marshaling points in which armies from the local marches gather. They are substantive settlements in their own right, and provide support to the Marches-at-War. Many families live in these settlements, and they always feature the council hall that manages local affairs. Clansteads: Smaller towns and villages in outlying areas that provide support and garrison in more remote areas. Clansteads (III and IV): Khuul, Mok Moor, Rhun-Huk, Gnisis, Maar Gaan, Gargen Hul, Mandul, Cormar. *Iuval is a smaller Tier III or IV settlement, and is the March-capital of the now nearly defunct Waters’ March, deep in what is now Hlaalu territory. War leader of House Redoran. Crab-Chiefs and other very prominent leaders (all are currently in Ald-ruhn). Patriarchs, currently leading the marches at home. Hetmen, direct servants of House Fathers and Councillors. Lowest leadership rank, protects a certain part of the march. Distinguished servant, tied to a particular march. Servant of the house, including guards. Accepted, standard member of House Redoran. Taken an oath to be initiated into House Redoran in the service of a clan. Just a hireling, not attached to the house.